This Sunday, Smash Wrestling presents “The Northern Tournament” with two shows in one day at the Phoenix Concert Theatre in Toronto. We had a chance to speak with Smash Wrestling promoter & wrestler Sebastian Suave on the concept behind the tournament and much more. This Sunday, Smash Wrestling presents “The Northern Tournament” with two shows in one day at the Phoenix Concert Theatre in Toronto. The tournament will feature Matt Riddle, Joey Janela, Joey Mercury, Tyson Dux, Mia Yim, Joe Hendry, Kevin Bennett, and Andrew Everett among the sixteen participants. We had a chance to speak with Smash Wrestling promoter & wrestler Sebastian Suave on the concept behind the tournament, taking us into the planning phases of such an event, the climate of Ontario independent wrestling, and many other subjects that we hope you enjoy. When did the idea of The Northern Tournament begin and how did you go about forming a list of talent you wanted to be part of the events? We always look back at some of our shows and determine what could be done different especially those that are annual like our tournaments. You have to eventually debate whether you scrap it, make it bigger or do something different. The Gold Tournament produced great in-ring matches, quality stories, and some buzz but it was something that only the local market enjoyed and invested in. We are continuously trying to be a promotion with a global reach, so the product needs to reflect that. That means bringing in a lot of internationally recognized stars and while that means a few of our guys may have to take a backseat for a day it also produces an opportunity to shine on a bright stage for the roster members competing. What is the concept behind the Northern Tournament and the expectations you have placed on this doubleheader that will make it a success? We wanted a tournament to be recognized up there with PWG’s BOLA, CZW’s Best of the Best, PROGRESS Wrestling’s Super Strong Style 16, wXw’s 16 Carat Gold and others. All of those tournaments represent a different country or are based on a different side of the United States. There is no such tournament on that level north of the border in Canada and we want to put our money where our mouth is. We want to be that platform for the Canadian talent and the Canadian scene itself. I truly believe over time it will give the Canadian scene a reason to rally behind not only its Canadian talent pool but also to show off the Canadian fans as some of the best anywhere. What is the best aspect of the Toronto wrestling market? Conversely, what is the most challenging part of running in the city? Toronto is a really saturated market for independent wrestling and to a greater extent so is the Golden Horseshoe which is the Southern Ontario strip from Niagara Falls to Oshawa. A lot of individuals within our market will tell you otherwise because they are accustomed to the current numbers and trends. Exceptional matches acknowledged by the diehard fans of the market doesn’t equate to success. That’s something to never take for granted but success is when wrestlers outside the market want to fight here and fans outside of the market (or those within not attending the independents) decide to join as new diehards. Otherwise, it’s masturbatory. I would proudly claim that a few promotions like Smash Wrestling and others in the Eastern Canadian scene have shown this promise in the past and present, and in turn that is the proof running in Toronto. You need competition to push you, not saturate you. We have that in our market. When you’re booking talent from around the world, what are the criteria that go into making that booking and faith that the investment will pay off? There is always a learning curve to this, but we want talent that wants to be here beyond the payday. We want the guys who have heard about us and who will proudly give the event a shout on social media without us asking. These are the ones that are good at connecting with fans. There is a level of authenticity to their appeal. Promoters and fans alike can see it and appreciate it. As a promotion, we need to give fans a reason to come spend their money on a ticket beyond “bucket listing” so they can see the talent live or getting an autograph. The talents who get this tend to be the easiest and most professional to deal with. They get it and that’s when you have faith in something or someone that there is a payoff. The Rosemary vs. Allie feud is a good example of that. This summer, you will be doing crossover shows with CZW, how did this partnership come about and do these shows with outside promotions differ in execution from a traditional Smash event? We started with a few crossover shows as a “friendly” rather than your cliché invasion angle. CZW was the first one we worked with a few years back and we managed subsequent events with CHIKARA and PROGRESS Wrestling. We also hosted a World Cup Canadian leg with What Culture Pro Wrestling. This was something fresh locally, but it also helped with our brand awareness beyond our borders. Running another event with CZW was always something of interest and the time was right in 2018. The execution of running an event with another promotion or hosting one differs with every group. A good partnership requires both sides to be heard and have their needs met. Good communication is the foundation of this. The logistics were a bit tougher this time around as we’re bringing them in for three events in our core three markets of Sarnia, London, and Toronto. So schedule availability and where certain individuals travel out of were prominent factors more so this time around. Since launching on The Fight Network, how has the transition been from presenting a live event experience into both a live event and television taping? For our team, it’s easy to present a live event and a live TV show separately. It’s challenge to try to do both at the same time. We did not want to lose the live Smash Wrestling atmosphere that we have cultivated by breaking down a live event into 3 to 4 tapings with constant breaks or by seeing the same talent two to three times to a lesser pop. There is a stigma with “TV Tapings” in the pro wrestling scene and that’s something we never wanted our fans to worry about. So we have never compromised the live event and I think that’s kept our live audience happy and allowed for us to present a product with a hot crowd for TV. The biggest challenge for us was finding a rhythm to ensure the live crowd, the social media audience and our TV/network audience are all in sync as best as possible. All of those fans and platforms matter. Beyond the matches, we want a live audience fan to see the same hype video as a fan watching on TV sees. There are a number of factors that go into making this challenging with time constraints being one. The easy answer is to shorten matches and content but then you take away what makes you special and different. So finding that balance and working on deadlines is always a battle but there are short and long-term game plans in place. Hopefully, those efforts come to fruition in the calendar year. Is there a performer on your roster that isn’t getting enough attention that you believe will breakthrough in the next 12-18 months? These guys have technically had their breakthroughs; however, until travel becomes less of a risk and these guys can find more work in the United States they technically can’t break out. No matter how big Smash Wrestling becomes these guys need to thrive on other large platforms beyond the home base platform to be legitimized and for Canadian athletes that need to be in the United States. A lot of guys like Brent Banks, Tarik, Mike Rollins and Tyson Dux have put in the time and have built their rep within their walls. Us landing on Fight Network and working with international partners like PROGRESS Wrestling and What Culture has helped build some recognition for these guys but the wheel needs to keep turning. They need work within the United States. That simply isn’t a case of if they are networking or willing to travel. Leaving the Canadian thing aside Kevin Bennett is a true superstar with the right package and attitude. He’s still young as well. The Well-Oiled Machines tag team with Pepper Parks (formerly Braxton Sutter) and Mike Rollins is just so special and organic. Anyone is a fool to sleep on them. As an independent promoter, what were your expectations for “All In” and what does the success of a show such as that mean to Smash Wrestling, if any? I don’t think it directly affects Smash Wrestling but the more positive buzz the wrestling scene gets beyond the WWE the better. Every fan, for the most part, starts as a WWE fan and doesn’t want to give the minors a chance much like in pro sports…until they have a reason to. A lot of our regulars became our regulars because they came to see Lance Storm, AJ Styles, Chris Hero, the Young Bucks, PROGRESS Wrestling, etc. The more guys like Cody, the Bucks and others give wrestling fans a reason to check them out beyond NJPW, ROH and so forth the more exposure the independents get. Perhaps more top guys follow in the steps of them and the likes of Joey Ryan and Colt Cabana. It will create an opportunity for said promotions. It’s in their hands from there to give those new eyes a reason to stay. One of the most popular acts at a Smash event is The Well-Oiled Machines, who have been able to take their music videos and make them a big part of the show. How does an idea such as that take form and go from an idea on paper into a finished product? Trust, teamwork, and fun all mixed in together. The Well-Oiled Machines’ start and evolution have been so organic but it required for those two guys to trust us and commit to the tag team. It then required us to trust them and give them a ball to run with creatively. To let them know the door is always open to talk shop and I think that’s where most of the team’s success has come from such as the “What’s in the box?” match and the subsequent in-ring moment that took place. Neither side had an idea set in stone with no compromise. How do you decompress in the hours and days after a major show, what is the comedown effect like? There isn’t one, to be honest within the hours or day after. Some show days start at 7 am and end at 4 am. Some of these guys have a job the next day. For myself, I have a three-year-old and a two-month-old that wakes me up in those limited hours of sleep and I have to get them ready for the day. As a roster member, I also have to lead by example and workout just like the roster. The day after tends to be a hectic day so to juggle all that with what is usually the busier days of the month makes for a stressful day. These days are filled with all the follow-ups for the previous event plus the preparations for the next event. I’ll be doing phone calls and emails throughout the day in addition to the usual day-to-day. I tend to decompress when there’s a window for it. Perhaps our team has done a great job of getting our ducks all in a row and we have a quiet workday or two ahead of us. I don’t take those days for granted. 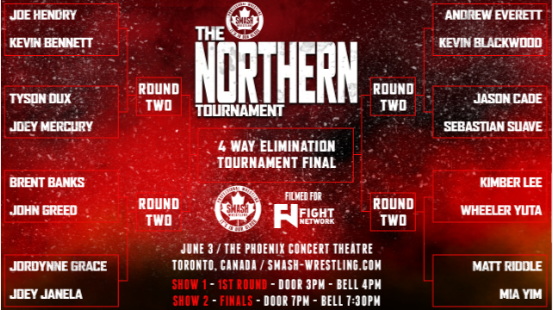 Smash Wrestling presents “The Northern Tournament” this Sunday with the first card at 4 pm and the second show at 7:30 pm from The Phoenix Concert Theatre. Tickets can be purchased at www.smash-wrestling.com.